Well, technically, this also includes Yugoslavia... but shortly I will add another from immediately right afterwards. 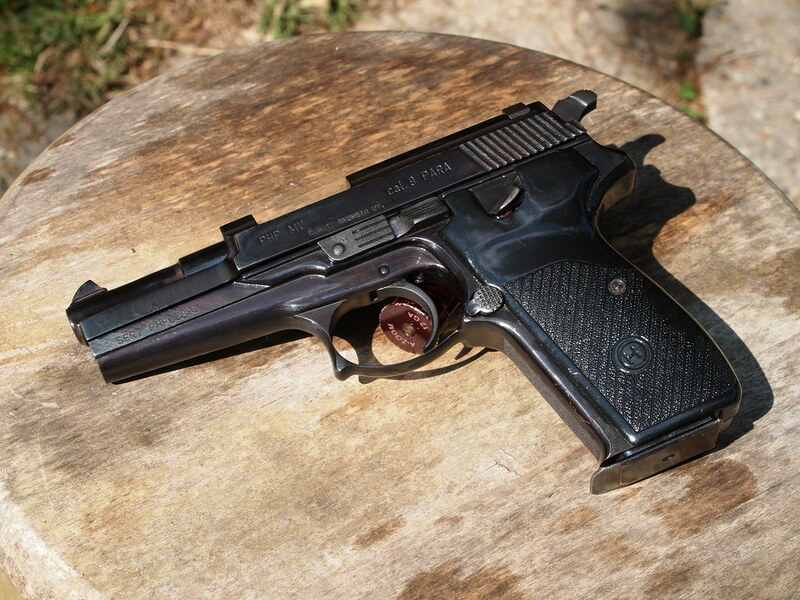 I picked up a Yugoslavian CZ 99 a little while back for not much at all, and it's a sturdy, reliable pistol. There are a lot of Sig similarities, but the CZ 99 is a bit thicker, and a bit shorter than the Sig P226 I recently added. All features work as advertised- the ambidextrous decocker/slide release works fine. And despite the trigger being a bit mushy, the gun really is pretty accurate and I've had no failures with it. I'd say the biggest negative is the frame finish- it will come off if you look at it hard. After adding the Sig to the mix, I considered selling it off, but really, I don't have a lot invested in this one (and I really dislike getting rid of any of my guns). So, instead of selling, I decided to make it a matching set- I have a Croatian PHP MV 9 on the way, again for "not much". As I understand it, these two guns faced off in Bosnia, so I thought that for the price involved, they'd make an interesting pair. J&G... you're referring to the PHP? Can you go into a little more detail on your impressions of the guns? Most of what I've read has been biased, in that it's not a modern "plastic" gun; and some folks say there's spotty QA among the batches. The one I have on the way is supposed to be a "select" from a guy who has about 20, so it should be one of the better versions. I'm ok with it being a heavy steel pistol, and I'm hoping it's enjoyable as a casual shooter. Last edited by 72 usmc on Wed Jul 19, 2017 11:05 pm, edited 5 times in total. 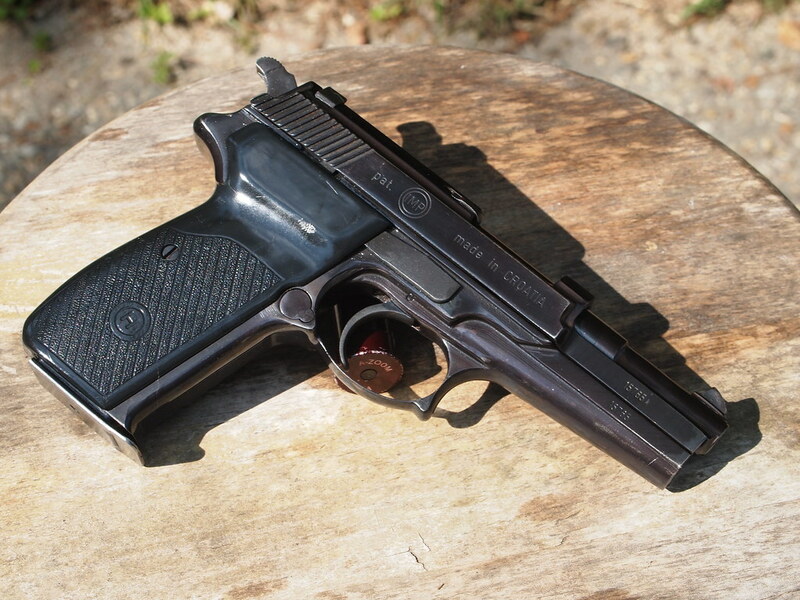 72 usmc, that is a nice looking pistol. The long barrel guns are neat. Ok, I went to sign for it and got hit with the delay again, it's basically expected that I wait 3 days after filling out forms. Probably 3/4 of the time. 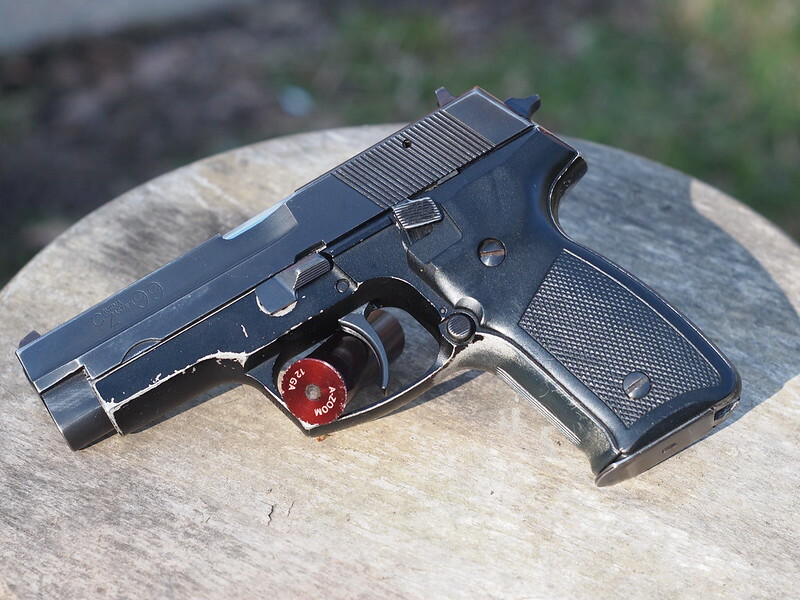 (I had won this and the Beretta 92S within 12 hrs of each other, and had hoped/intended to just do both on the same background check... but this seller took a few days to get shipping lined up. Won't go there much, other than neutrally state that he did charge more for shipping than the other party... oh well). Hopefully we get it released before the weekend. But I did get to examine it, and it's interesting. Gun is dirty and a couple scratches on the grip, but overall it looks in very good shape. I was kind of surprised at how small the case is. It does have the manual, cleaning rod, extra mag, and oil bottle. The safety is WEIRD... if you engage it with the hammer down, it disables the trigger. But if you do it with the hammer back, you can still pull the trigger, and the hammer will drop. It doesn't decock, but once the hammer is lowered, it does disengage the trigger. Not sure that it's functioning correctly, or if that's how it is designed. But I wouldn't trust it. Slide stays back on empty mag, but releases when you drop the mag. edited to add: I see it isn't supposed to release, maybe I bumped the release. I'll look at it more when it comes home with me. Croatian, not Serbian. First Croatian pistol, that's the name. The first pistol in the picture is a Zastava CZ 99. Mine is marked Yugoslavia, but Zastava is located in persent-day Serbia, and the guns made after the breakup are marked Serbia. That was the motivation for the PHP to be created- the Croatians found themselves without an established arms manufacturer. So while I wait for my release- any input on how the PHP shoots? It came home today, and I have to say: what a marvelously bizarre little creature it is! The gun has to be basically 95% or better, there is one small mark on the side of the frame, where the trigger bar rubbed it. Otherwise I'd say LNIB. I cleaned it down and reassembled it (and thankfully there are youtube videos showing how to do that, it's a weird process). Has a brownish, almost coffee color to it. The light brown areas, like on the barrel, are not rust, but just look like the color didn't take as deeply. 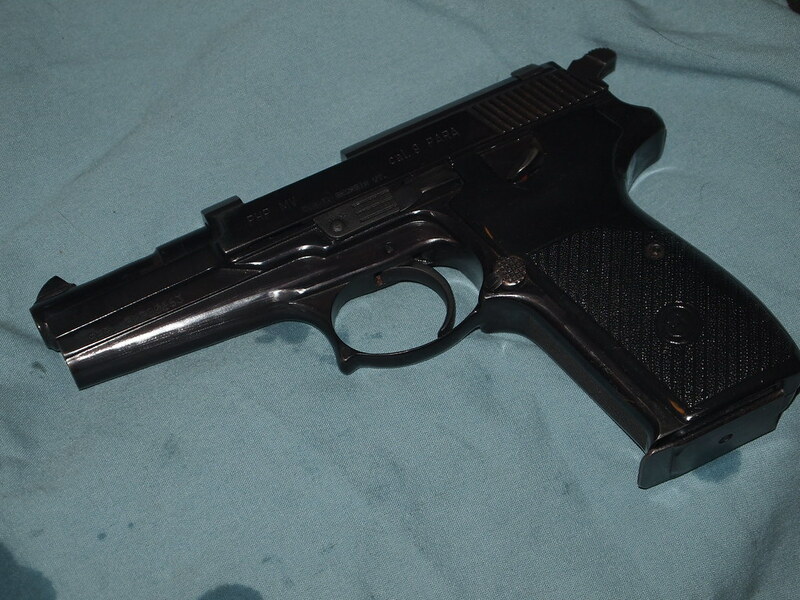 *added*- a quick examination shows a completely different gun than the first one I posted. I called the seller after winning the auction, and he was pretty happy to talk about the guns, he said he had a few of these. After talking awhile, he told me he'd look through the batch and pick out a nice one. Just a brief update on the PHP MV9- I did a range trip the other day with it, and I am very, very pleased overall with it. It put some ragged holes in the bullseye when I did my part. No failures in about 70 rds of S&B 115 gr FMJ. I checked another board for info, and I seem to have one of the highest serials, (highest one listed that I could find), making it one of the last ones made, as far as I can tell. There have been some improvements over the initial design, particularly with breakdown. I don't need to do the dance with the spring, there are grooves in the slide so that the slide lifts off. In a nutshell- lock slide back, turn the lever, bring slide back to battery, lower trigger, move slide forward about an inch, rotate the slide off from the rear. Yeah, the weirdness is definitely an appeal. I would have liked to have found one with the 5 inch barrel, those sort of look like Star Wars blasters. But I understand those were mostly early makes, and the later ones were better. Either way, it's neat to shoot a "what is THAT you have" gun, and satisfying to know it's accurate to boot.